The foliferous stem and branch of Taxillus chinensis ( DC.) Danser. of family Loranthaceae. Guangdong, Guangxi, Yunnan provinces, etc. Collected from winter to the following spring. Brownish peel, even branch, leafiness, with trunk bark of mulberry tree. Cut into segments, dried, cut into thick pieces and unprocessed. Pungent, bitter, sweet, mild; liver and kidney meridians entered. Dispel wind-damp, tonify liver and kidney, strengthen tendons and bones, prevent miscarriage. It can dispel wind-damp, and excels in tonifying liver and kidney, strengthening tendons and bones. It is suitable for treating chronic arthralgia syndrome, damaged liver and kidney which is characterized by soreness and weakness of waist and knees, weakness of tendons and bones; it is often combined with liver-kidney tonics, qi-replenishing and blood-nourishing herbs, for instance, Du Zhong, Ren Shen and Dang Gui, as in Du Huo Ji Sheng Tang from Qian Jin Fang. It can tonify liver and kidney, strengthen thoroughfare and conception vessel, and prevent abortion. For deficiency of liver and kidney and insecurity of thoroughfare and conception vessel manifested by profuse menstruation, metrorrhagia and metrostaxis, bleeding in pregnancy and threatened abortion, it is usually combined with liver-kidney tonics, blood-nourishing and abortion-preventing herbs so as to reinforce the effects of arresting metrorrhagia and stopping bleeding, and preventing abortion, for example, E Jiao, Xu Duan and Tu Si Zi, as in Shou Tai Wan from Yi Xue Zhong Zhong Can Xi Lu. 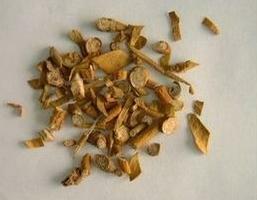 In addition, it is used in treating coronary heart disease and hypertension at present.